Graphite is seldom found isolated; it is usually mixed with clay and iron oxide, or is part of a rock. This specimen is relatively pure and shows the properties well. Graphite makes a good lubricant because of its basal cleavage and greasy nature. 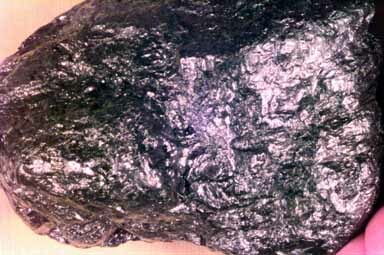 It forms from the metamorphism of carbonaceous material in sedimentary rocks and so is typically found in schists (e.g. graphitic schists). Steel gray to iron black; metallic; grayish to black streak; hardness 1-2; greasy feel; perfect basal cleavage (although the crystals are normally so small as to be invisible).